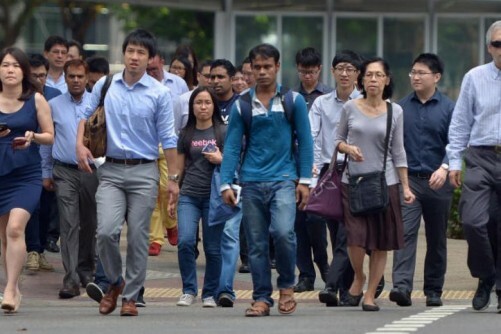 SINGAPORE - Salaries across industries in Singapore will likely rise by an overall 3.9 per cent next year, without taking into account inflation, human resource consultants Mercer said on Wednesday (Nov 29). The majority of industries in fact will enjoy higher salary increases, with the exception of the life insurance, Internet, real estate, banking and logistics industries. The findings come from Mercer's "Compensation Planning for 2018" report for the region, which includes predictions for hiring intentions and pay increases across Asia, Middle East and Africa. Mercer warned that a rise in inflation could depress wage increases, with most employers not planning to increase human resource budgets in 2018. In Singapore, employees in legal, finance, and research and development will see the biggest pay increases next year. This year, the chemical, life sciences, and consumer goods industries topped when it came to highest base pay and total cash increases for executive roles. The Mercer report said: "Even with the rebound in exports and trade, with the recent multilateral trade agreements, we do not expect a significant impact on wage growth in 2018. Positive signals of revival from the semiconductor and biotechnology sector imply that specialist engineering and sales talent will be in demand." Singapore's working-age population is set to shrink from 2025, and much like other advanced economies, Singapore faces the challenge of lifting productivity in order to sustain GDP growth. Despite these challenges, world-class infrastructure, strong regulation, and a sound track record of forward planning means Singapore remains a highly competitive economy, the report said. GDP growth is expected to ease to 2.5-3.0 per cent per annum in 2018-22, in line with the government's expectations, but far from the high of 4.7 per cent per annum in the decade leading up to 2016, according to consultant IMA Asia. Kulapalee Tobing, Mercer's Singapore career products leader said: "With the new industry skills frameworks being introduced by SkillsFuture, companies are looking to both reskill existing talent pools as well as also hire for different skillsets even when hiring for replacement roles. The current focus on restructuring the economy and raising productivity by the government has meant a sharp focus on continuous learning." Overall in Asia next year, the highest salary increases are forecast for Bangladesh (10 per cent), India (9.8 per cent) and Vietnam (9.1 per cent), while fellow financial hub Hong Kong is forecast to also see a 3.9 per cent increase like Singapore. Japan is forecast to have the lowest increase at 2 per cent, followed by New Zealand (3 per cent) and Australia (3 per cent). Notably, real wage growth, defined as salary increase minus inflation rate, has been steadily rising in the region, often reaching double digits in emerging markets. And, while forecasts vary quite widely across specific industries, the strongest push is likely to come from the chemical and life sciences industries, Mercer said.